The drama’s all me, though. When they dragged her out of me, she greeted me by raising herself up, screaming, and slamming her tiny fists into my chest. For a moment, I didn’t believe she was real – she looked like something Ray Harryhausen had made – but she was so beautiful. I felt terrified, intimidated, but at the same time, fiercely proud. Aww hell, I thought, we’ve got ourselves a right one here. I’ve spent one evening away from her since she was born, and she screamed until she passed out, exhausted, hours later. She threw up over Him Indoors. (He’s good with her – like today, when he educated her in the ways of Iron Maiden while I nipped out to the shop – but she always needs her mum at bedtime.) 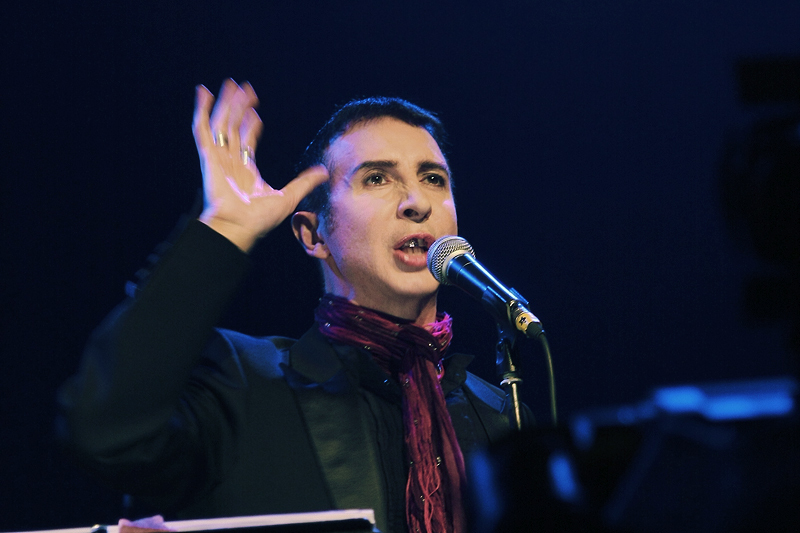 So, I knew that I wasn’t going to be able to make it down to the Royal Festival Hall to see the Meltdown festival, where Marc Almond was going to be re-enacting Torment and Toreros. While I quite like Marc Almond, the big pull was to see what JG Thirlwell was going to be doing, since he played all the instruments on A Million Manias. I very much would have liked to have spent my evening queuing at the bar, deciding whether to have a diet Coke or a beer (just the one), then finding a seat in a room full of strangers, eavesdropping on half-heard conversations, glancing around to see if there was anyone I recognised, thinking that perhaps I used to know the girl in the pink coat on the other side of the aisle, but figuring that she probably wouldn’t remember me anyway. I’d have checked my phone compulsively and then checked with equal compulsiveness whether I’d set it to silent. I’ve have wished I’d worn more comfortable shoes, but be glad in spite of myself that I’d worn the pretty ones. I’d have stilled in anticipation as the lights dimmed, then fidgeted in my seat, wishing I had a better view of the stage. Wishing I hadn’t sat behind the tall person. Wishing that person to my left would stop talking so loudly. Wishing the one on my right didn’t keep getting up to use the loo. Then the music would have started, and even though I didn’t know a single song, I’d have been caught up in it, carried away by it, and been thrilled and inspired by it. Over, far too soon, then off to catch my train and spend far too many hours trying to get home. Even so, however much I’d have enjoyed the gig, there’d have been a part of me fretting about my little girl and wishing that I’d stayed at home. Back in this reality, I was tired of saying, “Go to sleep”. She’d had her bath, her bottle and story, and was now pacing back and forth in her wooden cage. Crawling to the end, pulling herself up (at eight months, she’s as tall as the crib) and then toppling over. Bursting into tears, until I picked her up and held her. Mummy kiss better. Gently place her back in the cot, shushing her soothingly while thinking, for f***’s sake. After 90 minutes, I was thoroughly bored. Her cheeks were bright red from teething. She didn’t know where to put herself. Another clean nappy, another sip of water. Go to sleep. She stared at me, pleadingly, a perfect picture of misery. I told her I’d get the Calpol, I’d be right back. She burst into tears again. I hurried back, then struggled with her as she clamped her mouth shut. I tried to explain: the medicine will make it better. She turned her head, defiantly. She opened her mouth – I popped the spoonful in – and that was the moment she intook her breath to scream … and began instead to choke. And gag. Oh s***. I tried to get to the bathroom, but too late: she opened her mouth and spewed all over me. I sat for a moment, with her in my arms, racked with guilt and panic. She was misery, horror and pain. She opened her mouth again and retched some more. I quietly celebrated the hat-trick: I’d been peed on, pooped on and puked on that day. Go me. (Poor her.) Another bath, bottle and cuddle later, I placed her in her crib and stroked her hair. She looked at last contented, and finally fell asleep. Time to scrub that carpet. Tonight, I tried a different tack. Before giving her the bedtime drink, I offered her some Calpol. She refused, looked anxious and began to struggle. I indicated that I wouldn’t force her, and she relaxed. I waited until her head was turned and poured it into her milk. She eyed the bottle suspiciously a couple of times, but drank without complaint. She fell asleep quickly, oblivious to her burning cheeks. Then I crept downstairs and found what I was looking for. I guess I didn’t miss it after all.